I was recently in the market to sell complete copies of some of my Game Boy Advance library, and I came across a certain title I only touched once. Rather than stupidly sell off a game I hadn't fully played, I placed the cartridge into my Nintendo DS Lite's GBA slot, and powered that sucker on. The game that I didn't sell (and am glad I didn't!) 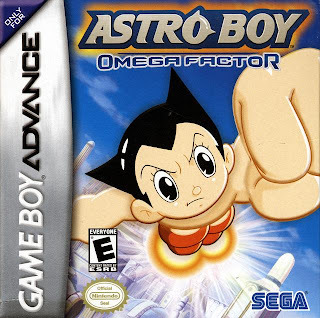 is none other than Astro Boy: Omega Factor. Here is my retro review. finds its way onto the Game Boy Advance. What is essentially the grand-daddy of modern anime, Osamu Tezuka's Astro Boy manga and following cartoons have greatly shaped Japanese animation and culture. The character of Astro is a charming and endearing one, and the stories presented can range from lighthearted and cheery to dark and somber. Like any excellent material, the Astro Boy franchise needed a video game to represent itself well, and unlike Sonic Team's PlayStation 2 Astro Boy project, legendary developer Treasure's attempt to bring Astro and the gang into the realm of video games is a successful one. 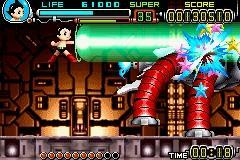 The end result is 2D beat 'em up known as Astro Boy: Omega Factor for the Game Boy Advance. Astro Boy: Omega Factor's plot is based off of various versions of Astro Boy, such as the 1952 manga, the original 1963 animated program, the 1980s remake, and the 2003 episodic series. There are plots regarding the robotic metropolis in Antarctica, the mysterious land of Mu, the time traveling exploits of the Marine Express, the increasingly dire conflict between humans and robots, and the all-powerful Death Mask. Astro unleashes a large laser wave on this boss. 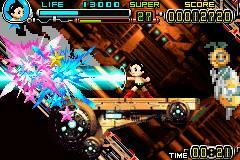 Omega Factor's gameplay in typical levels is 90% action-packed beat 'em up and 10% platforming. Of the latter, there is little in the way of complication. In the beat 'em up sections, Astro moves along one of seven linear levels, defeating foes with a variety of attacks such as punches, kicks, laser beams, and machine gun fire. The last two are special attacks which require energy to use. This energy is easily acquired through dishing out damage to enemies. The fighting can become a bit repetitive when you're faced with the same battle strategies time and time again. This is compounded by the fact that the level design is truly nothing to champion. It seems rather sloppily put together. a terrific attack for clearing battles. As Astro meets various non-playable characters, he gets the ability to upgrade one of his stats. He can increase the amount of health he has, the damage and length of his laser attack, the capabilities of his turbo jet, the power of his punches, the longevity of his machine gun special attack, and his sensor abilities. A lot of the NPCs in Astro Boy: Omega Factor are optional, but it's to the player's benefit to find as many as possible to boost Astro's stats and make an already challenging game all the easier. In addition to helping out Astro and the player, all met characters will get an encyclopedia entry in the titular Omega Factor. This gives players in-depth info on all characters of the Astro Boy universe, including where they appeared in the various canon of Osamu Tezuka's workings. 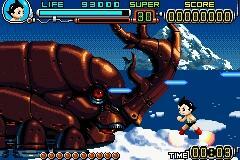 Outside of traditional beat 'em up style brawls and searching for new NPCs, Astro Boy: Omega Factor features horizontal auto-scrolling flight levels where Astro needs to dodge enemy attacks while showcasing his own offense. These levels do quite well in breaking up the monotony of the normal ground levels-- as do the challenging and entertaining boss battles intermixed throughout the game. Astro Boy: Omega Factor is essentially split into two parts. As stated, the game has seven levels. These seven levels are split up into several parts. Once the initial play-through is completed, the story makes it so Astro must go through the levels once more-- this time with different motivations and character appearances. The second time around players can use the stage select feature, not offered in the first go through the game. Between the three difficulties (easy, normal, and hard), all of the NPCs that can be discovered to fill out the in-game encyclopedia, the mass of upgrades for Astro, and the urge to go for higher scores per stage, Astro Boy on the Game Boy Advance possesses a fair deal of replay value and bang for one's buck. Something about this boss just bugs Astro. Perhaps the only other criticism I can make about Omega Factor is near the end of the game. Astro needs to revisit various stages to advance the story. However, if a player forgets where he or she met a given character, it can become a serious effort in frustration. I guess I cannot complain too much with the advent of online guides. One of the most outstanding parts of Astro Boy: Omega Factor are the vibrant visuals. The game is fast-paced and looks the part of a serious graphical contender. Everything from the way the bosses animate to how intricate backgrounds are designed is particularly impressive. The only downside is the occasional bout of slowdown that happens when a lot of enemies or action is on the screen at the same time. just wait until you see it in motion. 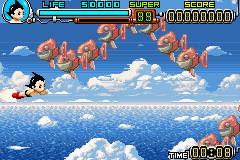 Astro Boy: Omega Factor is a piece of the Game Boy Advance library that should not go unplayed. Even if you do not have a firm grasp of the source material, it is a fast and fluid game that will delight you. 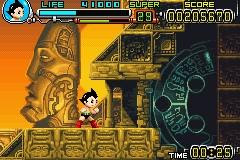 Treasure has a mastery of these types of action-oriented games, and Astro Boy: Omega Factor can be proudly placed next to such titles as Gunstar Heroes, Radiant Silvergun, and Ikaruga. It is not perfect, but it certainly gets the job done.